December 2015 brings the 20th Anniversary Edition, pressed on limited edition Gold Vinyl in a double gatefold cover! The second and last album of all four original Pharcyde members...that is, until their reunion album comes out...we can always hope can't we?! 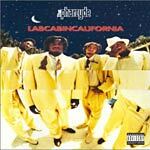 Labcabincalifornia shows more maturity in the group's growing phase, without losing anything from what they had with Bizarre Ride. With hits like ''Runnin,'' ''She Said,'' and ''Drop,'' this is definitely an album that should be in everyone's collection.